Is BioSpecifics Technologies Corp. (NASDAQ:BSTC) Worthy of Your Portfolio? We at Insider Monkey have gone over 700 13F filings that hedge funds and prominent investors are required to file by the SEC. The 13F filings show the funds’ and investors’ portfolio positions as of September 30th. In this article we look at what those investors think of BioSpecifics Technologies Corp. (NASDAQ:BSTC). Is BioSpecifics Technologies Corp. (NASDAQ:BSTC) worth your attention right now? Prominent investors are turning bullish. The number of long hedge fund positions increased by 2 in recent months and the company was in 10 hedge funds’ portfolios at the end of September. Still, that number was far from enough for it to be seen as on of the 30 most popular stocks among hedge funds in Q3 of 2018. “Biospecifics (BSTC) is a $425 million biopharmaceutical company that was founded in 1957 and is headquartered in Lynbrook, New York. We have held Biospecifics shares in the Fund since inception. The company is unique in that it only has five full-time employees and its primary source of revenue consists of royalties from a drug called Xiaflex. We were attracted to the company because it has high insider ownership, requires very little capital to grow and has a history of free cash flow generation combined with a very strong balance sheet. Additionally, the stock has limited sell-side coverage and was trading near a three-year low when we entered the position. Xiaflex is marketed by Endo Pharmaceuticals in the United States and Biospecifics receives a low double- digit royalty on sales and a small mark-up on the cost of manufacturing the drug. Xiaflex is currently approved as a treatment for Dupuytren’s contracture and Peyronie’s disease. We are modeling Xiaflex sales of over $250 million in 2018 representing a 20% y/y increase. Growth is primarily being driven from the Dupuytren’s contracture indication due to a recent direct-to-consumer advertising campaign featuring pro golfer Tim Herron. We believe that peak annual sales from the two current indications could reach $350-450 million over the next few years. Our thesis on Biospecifics hinges on the sales opportunity for a new indication in cellulite, a condition that affects up to 85% of post-pubertal females. When we established the position, we believed that the market was attributing little to no value for this large and untapped opportunity. Few treatment options exist today that provide a tangible benefit for this patient population. In a 375-person phase 2b study, which was released in November of 2016, Xiaflex showed a meaningful improvement in the treatment of cellulite. The clinical results were highly statistically significant on the primary endpoint, which was a two- point improvement in a physician and patient assessment of the appearance of cellulite. The drug was proven safe with the most common adverse events being injection site pain and bruising. The company’s partner, Endo, commenced a phase 3 study in early 2018 that enrolled 840 women with moderate to severe cellulite. The primary endpoint in this study is the same as that used in the phase 2b study. Based on the positive phase 2b study, it is highly likely that the phase 3 study will also show a statistically significant benefit across the same endpoints and in essentially the same patient population. Endo expected to have results in early 2019 but will now release the data in 4Q18 due to faster-than-expected enrollment in the study. We believe the quick enrollment in the phase 3 study has positive implications for the drug’s commercial potential if approved. The overall injectable aesthetics market represents $3.5 billion in annual sales in the United States. Botox is the best-known brand in the injectable aesthetics market generating sales of roughly $1 billion annually. In the United States, the aesthetics market is large and growing because people care how they look, and they are willing to pay to look better. According to a recent investor presentation made by industry leader Allergan (AGN), the millennial generation has emerged as a key consumer of aesthetic therapies propelled by more buying power than baby boomers. We believe that the market is significant for an effective cellulite product with an annual peak sales potential of $300-500 million. And, unlike the two existing indications, cellulite would be a cash-pay market, which would argue for a higher multiple on the stock. The company also has a meaningful pipeline of opportunities with Xiaflex beyond cellulite including adhesive capsulitis (phase 2), human lipomas (phase 2) and uterine fibroids (phase 1). With a composition of matter patent not expiring until 2028, Biospecifics has a long runway to pursue these new indications. Additionally, given the difficult manufacturing process associated with making the drug, the company may enjoy exclusivity well beyond the 2028 timeframe. Importantly, Endo pays for all clinical development costs for future indications. Now, we’re going to check out the fresh hedge fund action surrounding BioSpecifics Technologies Corp. (NASDAQ:BSTC). How are hedge funds trading BioSpecifics Technologies Corp. (NASDAQ:BSTC)? At Q3’s end, a total of 10 of the hedge funds tracked by Insider Monkey held long positions in this stock, a change of 25% from the second quarter of 2018. 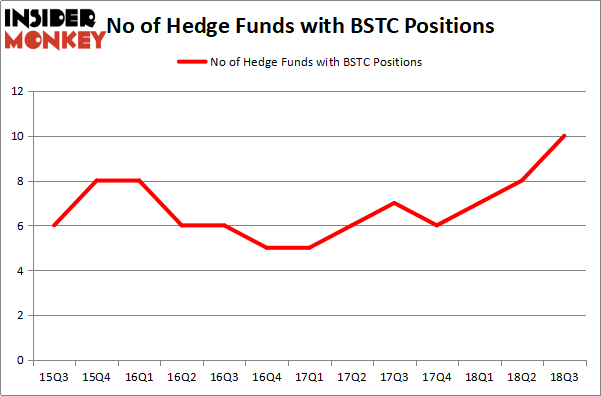 Below, you can check out the change in hedge fund sentiment towards BSTC over the last 13 quarters. With the smart money’s positions undergoing their usual ebb and flow, there exists an “upper tier” of notable hedge fund managers who were increasing their holdings considerably (or already accumulated large positions). 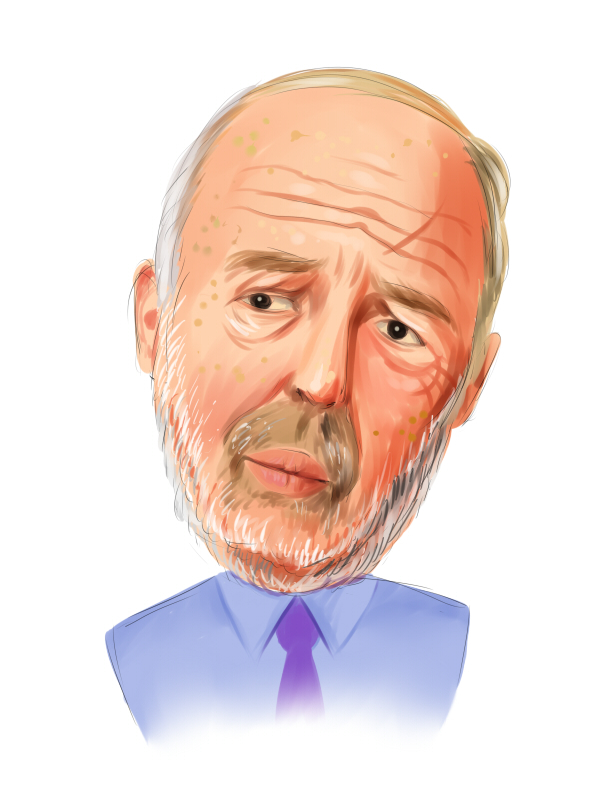 When looking at the institutional investors followed by Insider Monkey, Renaissance Technologies, managed by Jim Simons, holds the number one position in BioSpecifics Technologies Corp. (NASDAQ:BSTC). Renaissance Technologies has a $30.8 million position in the stock, comprising less than 0.1%% of its 13F portfolio. Coming in second is Cliff Asness of AQR Capital Management, with a $4.5 million position; the fund has less than 0.1%% of its 13F portfolio invested in the stock. Other hedge funds and institutional investors with similar optimism comprise Chuck Royce’s Royce & Associates, and Noam Gottesman’s GLG Partners. As industrywide interest jumped, key hedge funds were leading the bulls’ herd. Eversept Partners, managed by Kamran Moghtaderi, initiated the largest position in BioSpecifics Technologies Corp. (NASDAQ:BSTC). Eversept Partners had $1.3 million invested in the company at the end of the quarter. Efrem Kamen’s Pura Vida Investments also made a $1.2 million investment in the stock during the quarter. The only other fund with a new position in the stock is Roger Ibbotson’s Zebra Capital Management. Let’s also examine hedge fund activity in other stocks similar to BioSpecifics Technologies Corp. (NASDAQ:BSTC). We will take a look at Cedar Realty Trust Inc (NYSE:CDR), resTORbio, Inc. (NASDAQ:TORC), Trinity Merger Corp. (NASDAQ:TMCX), and Barnes & Noble, Inc. (NYSE:BKS). This group of stocks’ market values are similar to BSTC’s market value. As you can see these stocks had an average of 12 hedge funds with bullish positions and the average amount invested in these stocks was $50 million. That figure was $45 million in BSTC’s case. Trinity Merger Corp. (NASDAQ:TMCX) is the most popular stock in this table. On the other hand resTORbio, Inc. (NASDAQ:TORC) is the least popular one with only 4 bullish hedge fund positions. BioSpecifics Technologies Corp. (NASDAQ:BSTC) is not the least popular stock in this group but hedge fund interest is still below average. This is a slightly negative signal and we’d rather spend our time researching stocks that hedge funds are piling on. In this regard TMCX might be a better candidate to consider a long position.